Sermon – Andy Stanley – Guardrails – Why Can’t We Be Friends? Andy Stanley, lead pastor of the mega-sized North Point Community Church, nestled in the heart of Alpharetta GA, is an amazingly challenging teacher. I regularly listen to his sermons and recently ran across one everyone should spend time appreciating and digesting. In case you do not have the time to listen to the complete sermon, I have written my notes from the sermon below. As of today, 7/15/2010, you may click on the following link to watch the sermon “Guard Rails – Why Can’t We Be Friends”. Only God knows how many thousands of miles of guardrails line our roads and interstates. Guardrails are designed with simplistic purpose. They create a small accident to protect you from a larger incident. We rarely pay attention to or think about guardrails until we need them. When we need or use them, they can save our lives. 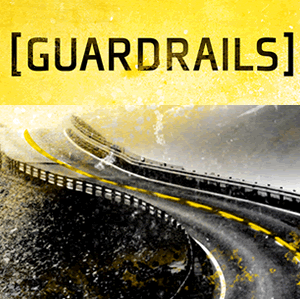 Applied to our lives, spirituality and relationships, guardrails can help guide and protect us. In this context, Andy redefines guardrails as “a standard of behavior that becomes a matter of conscience”. Most likely our biggest mistakes in life could have been avoided if we had guardrails steering us in the right direction. The goal should never be to see “how close I can get to a guardrail without crashing”. Ideally we will never get anywhere near the guardrail. We need guardrails to keep us from ever going “too far” or from moving in a dangerous direction. Friendships are powerful. They mold, define, and grow us in a direction. They impact our present and future. We do life with friends. We all have wonderful stories of soul-touching friendships, and unfortunate stories of mistakes and pain. Often, our biggest regrets are made in the company of our closest friends. We are honest, vulnerable, and exposed with friends. We become less careful, drop our guards, and are easily influenced by friendships. Whether you like it or not, you are deeply associated with the company of friends you maintain. Simple right? Solomon offers a promise (walk with the wise and become wise) and a warning (a companion of fools suffers harm). As much as we do not want to admit it, we know this. Good parents are constantly monitoring their children’s friendships. You may remember being belligerent towards your parents when they did not allow you to spend time with certain kids in grade school. Somewhere along the way, however, we can forget to exercise the same level of caution as we develop friends in adulthood and as married couples. Growing and maintaining friendships when you are married can be quite confusing, difficult, and awkward for a variety of reasons. In the beginning, we bring short or long-term friendships into our marriage that do not necessarily include our significant other. Sometimes these life-long friends may be of the opposite gender, so managing, guarding, and potentially ending the relationships can be emotionally and spiritually stressful. Once married, it can be difficult finding couples with whom both you and your spouse get along well. Sometimes the husbands or wives do not mesh. In other, potentially more confusing situations, the wife and husband within each couple may “click” more than the wife-wife or husband-husband. A touch more confusing are scenarios involving single or even married couple friendships from “back in the day” (a.k.a: when you were an idiot and not really pursuing a relationship with God). Also in the mix… it’s important for husbands and wives to each have same-gender friends for counsel and accountability. Obviously, the most important friendships are between you and your creator, then you and your spouse. In the hustle of life, managing all these relational connections can be outright exhausting. Based on all the above, Andy developed the following “guardrails” that we should ALL put into practice. Guardrail #1 – It dawns on you that your core group isn’t moving in the direction you want your life to be moving. This should concern you to the point that you recognize it and do something about it… and DO NOT wait until there’s a problem! Step back and HONESTLY evaluate where you are going and where the lives of your core friends are going. When you realize this, actively seek out and invest in an additional or new group people. Look for a better place to start putting down roots. Regardless of intentions… “companions of fools will cause suffering and harm”. Guardrail #2 – You catch yourself pretending to be someone other than who you really are. You may also hear the following within your conscience: “I’m not myself” or “I don’t feel comfortable”.… you should think about this. You are probably pretending to be someone you are not… and you know it. PULL BACK from these relationships. Some of us have been directly warned about this but do not notice the sirens and flashing lights. You may have heard a variation of the following phrase: “When you are around these people you are not yourself… you act differently”. This should cause you GREAT CONCERN. Sometimes we get defensive, but most of the time our significant others are right. Guardrail #3 – You feel pressure to compromise. When you are with these people, you probably ignore certain values or try to rationalize with yourself. True and good friends will point you what is right, good, and righteous. In these situations, what has never been a temptation before suddenly becomes a live and real option. You begin considering behavior(s) you have always thought of as “off-limits. This should concern you and your flags should start going up. If you are considering being in the proximity of [fill in the blank], but tell yourself you will not participate or engage then 99.99999% of the time, you have no business going! We should flee from sin and immorality, not see how close we can get. This should be a warning and wake-up call that you notice! In these situations, you are just too close. You never know when things could get out of hand. You could do something you regret or be guilty by association. Guardrail #5 – You hope the people you care about most don’t find out who you were with or where you have been. Something inside you tenses up when you think about the people you care about most knowing where you were, what you were doing, or who you were doing it with. To some extent, you feel you may have to defend yourself. In these situations, your mind is working in overdrive conjuring an excuse, explanation or rationalization to have readily available if needed. This should bother you. As you read the “Guardrails” you may have immediately pictured certain faces in your mind. Take note of that and pray for wisdom, discernment, and courage. The next part is very relationally complicated, which is precisely why most people do not bother handling it or doing what’s right. We often tell ourselves lies like “I’m just being Christian and showing acceptance, compassion, or love by staying in this relationship”. You may also think “But I really love these people… Jesus modeled that we should love people.” These are sly lies from the depths of Satan. You are using compassion or love as an excuse for inaction. You are lying to yourself. This is not about your friends… it is about YOU and YOUR MARRIAGE. NEVER confuse or polarize compassion and wisdom; they do not compete with each other. Compassion should NEVER require you to make an unwise decision for yourself or your marriage. Intentionally drawing back from these relationships can be the most loving and compassionate action you ever take. The best thing you can do in life is stay on the correct side of the guardrail. This is where you model Christ’s heart. When people crash or when “crap” hits the fan… your friend will probably run to you first. You will be the “go-to person”. It is in these moments where we have true opportunities to witness with extraordinary wisdom, compassion, help, insight, and love. By withdrawing from the relationship(s), you allow yourself to be healthy and ready for these opportunities. Think about some of your biggest regrets… were you in the companies of friends or enemies? When reading through the Friendship Guardrails, did any people come to mind? If so, what is your next step? What is one tangible, intentional way you can practice “walking with the wise”? I’m actually a single woman who is trying to live a pure life for God and this series was exactly what I needed. I’ve listed to the message before but I like to refresh my memory with it so that I stay on track. Thanks for this post. I printed it out and stuck it next to my office computer to remind me how slippery I can be. I really enjoyed the study at church, but this is where the rubber hits the road. I am getting married soon and reading your post has clarified my position in Christ towards these issues. Thank you for glorifying the Lord. My wife and I love Dave and his advice has totally change our family tree forever. The whole guardrail sermons are powerful and so needed to live a successful, God honoring life. I wish I’d had this when I was young. But as an adult it is equally good to protect myself and avoid unnecessary suffering. Thank you so much Andy, I believe God has given you much wisdom because you apply what He teaches you.